Team Insurance, USSSA Roster and Gate Fee will be required before first game. NO EXCEPTIONS – please check-in at the office or concession stand 30-minutes before game start. All teams should be ready to present team/player documentation for tournament entry or protest. Example: Player legal name on roster must match birth certificate Ref: 3.03. The USSSA on-line roster (time stamped at time of coaches/managers) entry will validate player eligibility. Player legal name must match player birth certificate. If entry after tournament start determined by the tournament director will qualify/disqualify player eligibility. NO EXCEPTIONS. Head Coach/Manager is responsible for the actions of their team, coaches, players and fans. All teams should be ready to take the field 30 minutes before posted scheduled time. All teams are responsible for quality baseballs for game use. Two new baseballs from each team will be required at start of game. Additional game balls maybe necessary from each team. No infield practice allowed prior to game start. All teams protesting a bat during game play must call “time” BEFORE THE NEXT BASEBALL PLAY (ex: next pitch is thrown) and make the home plate umpire aware of a protest. All teams must contact the on-site tournament director and present them with $100 cash. The on-site tournament director will determine the eligibility of the bat. if eligible, the game will resume and the on-site tournament director will retain the $100 protest fee. if ineligible, the batter who batted the ball will be declared “out” and all runners on base (if applicable) will return to their original position on base (forfeiting any runs scored as the result of the batted ball or play in question). The $100 protest fee will also be returned to the coach and/or team manager. If a team is caught using an illegal bat more than one time during a weekend event, that team will be removed from the event and will forfeit their entry and gate fee. A list of current bats that have been removed from USSSA play can be found by clicking the link below. Click Here to view a full list of banned bats. 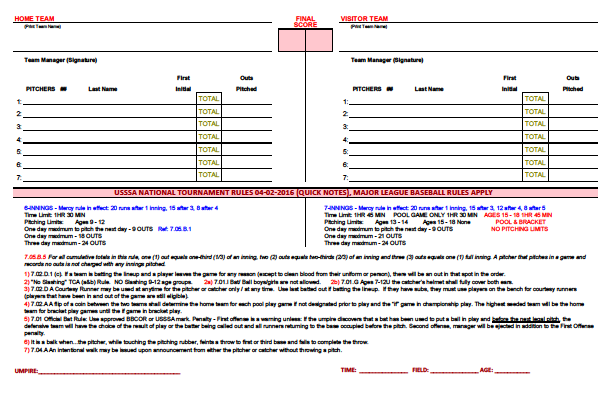 At the conclusion of the game a coach from each team is required to sign the official score card. Please be aware that the final score and pitching statistics will become OFFICIAL after both coaches sign the card and each team exits the field. If you find an error on the card, please alert the tournament director prior to signing your name. Click Here to view the Baseball Nation Official Tournament Scorecard.